All of the standard specifications shown are essentially prescription specifications that do not address the performance of the silica fume in a particular application. Basically, silica fume complying with these specifications will be similar to silica fume that has been used in the past on a wide variety of projects and that is described in the research literature. Do not rely on these specifications to predict concrete performance if you have a particularl application. There is no substitute for testing with your local materials to determine if a particular silica fume will meet the needs of your project. Note also that silica fume that does not comply with these specifications may perform very well in some applications. In particular, the requirement that these specifications contain for a minimum silicon dioxide content of 85 percent may not be necessary for all uses. 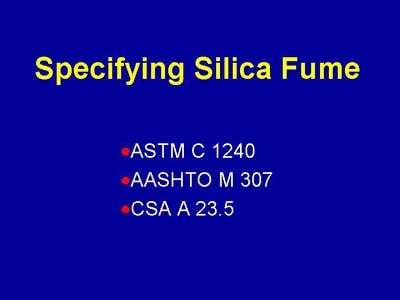 ASTM C 1240, Silica Fume for Use as a Mineral Admixture in Hydraulic- Cement Concrete, Mortar, and Grout. AASHTO M 307, Microsilica for Use in Concrete and Mortar. CSA (Canadian Standards Association) A 23.5, Supplementary Cementing Materials.